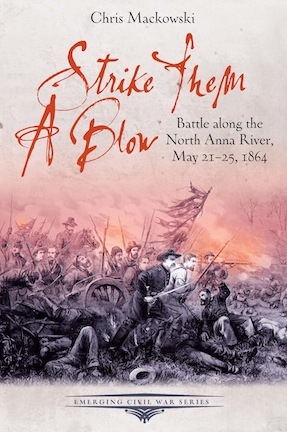 About the Book: For sixteen days the armies had grappled—a grueling horror-show of nonstop battle, march, and maneuver that stretched through May of 1864. Federal commander Ulysses S. Grant had resolved to destroy his Confederate adversaries through attrition if by no other means. He would just keep at them until he used them up. ECW first previewed Strike Them a Blow: Battle Along the North Anna on November 5, 2014. About the Author: Chris Mackowski, Ph.D., is co-founder and editor-in-chief of Emerging Civil War. He has authored or co-authored a dozen books on the Civil War, and his work has appeared in Civil War Times, America’s Civil War, Hallowed Ground, and Blue & Gray. Chris is a professor of journalism and mass communication at St. Bonaventure University in Allegany, NY, and historian-in-residence at Stevenson Ridge, a historic property on the Spotsylvania battlefield. He also works Fredericksburg and Spotsylvania National Military Park. Read his blog, www.emergingcivilwar.com.